To view 10 more pictures, interactive maps and the full, detailed description of the The Enclave at Princess Anne Homes community, please Login. These luxury new-construction homes set in the desirable Princess Anne area of Virginia Beach are uniquely designed with many high end finishes. There are 4 plans to choose from. Monroe, Valley Ridge, Nottoway and Shenandoah. Each stunning detached home is designed with options for you to plan a home that fits all your needs and desires. Nine foot ceilings throughout with gorgeous high board-and-batten trim, spacious open kitchens with large granite islands. Wood floors throughout the first floor living areas. The list of special details goes on and on with custom living room built-ins, transom windows, butler pantries, and cozy loft spaces. These distinctive 2 story homes are 2400 to 2800 sq ft with 4 and 5 bedrooms. Plenty of space for family living in this private community. The Enclave at Princess Anne is conveniently located near all the shopping, eating and entertaining you could want. The schools are top notch. North Landing Elementary, Landstown Middle and Kellam High School are some of the most sought after in the city. This prime location gives you access to many areas of Hampton Roads. Just 20 minutes to Sandbridge gives you easy access to relaxing beach days. If you prefer the busier pace of the Boardwalk in Virginia Beach, you are less than a 30 min drive.There are many golf courses within a few minutes. Commuting to Oceana Naval Base is less than 20 min drive. And Norfolk Naval Base is just over 30 min away. 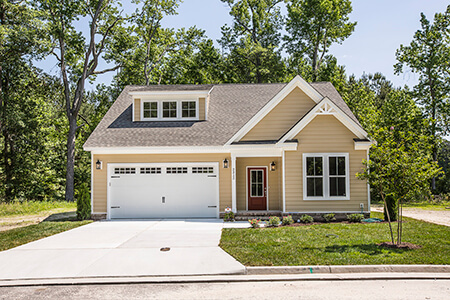 Send me more information about the The Enclave at Princess Anne Homes new home community. Our agents gladly offer FREE property tours of The Enclave at Princess Anne Homes, Virginia Beach and homebuyer consultations to all serious buyers.